With less than a week until Spring Training opens, it's time to dive deep into the Yankees' roster. You know the big names in camp. Aaron Judge, Giancarlo Stanton, Luis Severino, etc. Beyond those returning guys, there are the new players to watch including James Paxton, Troy Tulowitzki and Adam Ottavino. Further down the list, below the 40-man roster, are the non-roster invitees. These are the crop of players that you'll primarily see in the second half of Grapefruit League games, serving as extra arms or occasional fill-in starters when the regulars get rest. Many will be sent to Minor League camp in a few short weeks. Inevitably, a few NRIs will make an impact. Whether it's a prospect or a veteran, someone will break through and leave a mark on the Yankees' season. Let's highlight some of these nearly anonymous players who will start camp with the Bombers. In a lot of ways, Danny Farquhar is your average middle-of-the-road reliever. He's got a perfectly league-average ERA (3.93 for his career) with above average strikeout rates and a few too many walks. 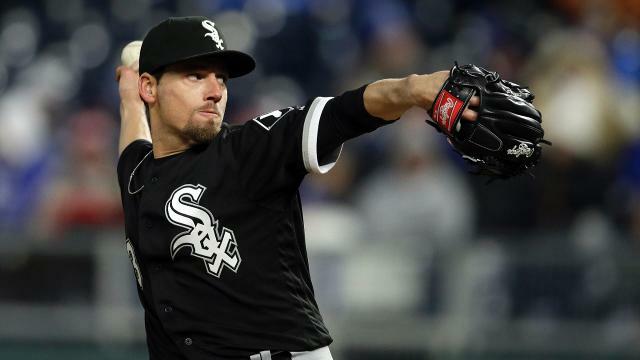 However, while with the White Sox last April, Farquhar suffered a brain aneurysm that nearly killed him. Luckily, it merely ended his season and after a long rehab, he's in camp with the Yankees. The right-hander was previously in the Yankees' organization in 2012, when he was traded for Ichiro. Now, at 31 years old, he'll get the chance to take another step toward stepping back onto a big league mound. The Yankees have a couple spots up for grabs in the bullpen. While Farquhar and others mentioned below are long shots, there's still an opportunity. Formerly with the Athletics, Danny Coulombe is much more than just a unit of electric charge. The left-hander struggled on the mound in 2018, hence his departure from Oakland, but he's previously served as a fine matchup reliever. Posting clear splits while getting fellow lefties out more often, Coulombe is the type of pitcher who could be out of a job if MLB forces pitchers to face a minimum of three batters. Alhough he tops out around 90 mph, Coulombe could give the Yankees another southpaw in their bullpen with Zack Britton and Aroldis Chapman getting full innings instead of matchup relief. Fellow lefty Stephen Tarpley is on New York's 40-man roster, though Coulombe has more Major League experience than the rookie. Ranked No. 57 in MLB.com's top prospects list, Estevan Florial is entering his second Spring Training in Major League camp. The toolsy outfielder is the Yankees' top prospect going into this season, though he's a few years away from breaking into the Majors. Florial should be a regular in the late innings of Grapefruit League action. If he performs like he did last year, it will be quite the show. The 6-foot-1 outfielder has plenty of potential. He struggled through injuries last year and enters his crucial age-21 season with high expectations. The Yankees churn out effective relievers better than just about anything else in their development system. Even in thin years, they've still seen pitchers like David Robertson, Adam Warren and Dellin Betances excel. Alhough Raynel Espinal is far from that precedent, he could be the next in line among homegrown relief options. Espinal reached Triple-A at age 26 last year. He may be a bit old for a relief prospect, yet he's been a strikeout machine, fanning 11 batters per nine over five MiLB seasons. Espinal still walks a few too many batters, but the 6-foot-3 righty will get a chance in the Grapefruit League to straighten out his stuff. Here's a two-for-one. David Hale and Drew Hutchison are depth starters, presumably beginning the season in Scranton. Each veteran righty spent time in the Majors last season, with Hale spending multiple stints in the Bronx. These are the type of up-and-down arms that could get a spot start but are more likely to eat innings in Triple-A, earn a brief long relief stint, find themselves DFA'd and then right back in Triple-A. Rinse, repeat. That was Hale's role last season and with the Yankees using a revolving door in the last spot of their bullpen last season, it could be yet again. Back on the prospect end of the invite list, Michael King was one of 2018's breakout players in the Yankees' system. King came over in November 2017 from the Marlins in a trade that sent Garrett Cooper and Caleb Smith to Miami. The 23-year-old Rochester native was downright dominant while moving from Single-A all the way to Triple-A. In 161 1/3 innings over 25 games (24 starts), King compiled a 1.79 ERA and 0.91 WHIP. He struck out just under a batter an inning while walking just 1.6 per nine. The right-hander could break into the Majors this season despite a crowded Yankees rotation. If he proves his 2018 was for real and not a flash in the pan, King could be one of the first pitchers in line for a spot start this summer.